Have you been thinking about installing a water treatment system in your home? Are you confused regarding whether you should install a carbon filter or a reverse osmosis system? Do you need a water softener or an ultraviolet system? Whether you choose to work with a water treatment professional or do the job on your own, having an understanding of the various types of home water treatment technologies is critical to making a good decision. You will be making a substantial investment in equipment, and you want to make sure that investment is the one that is most appropriate to your water treatment situation. In order to determine what type of water treatment technology would best suit your situation, it is important that you first analyze the quality of your incoming water supply, so that you ensure the water treatment equipment you eventually purchase will meet your specific water quality needs. For individuals who receive their water from a public water supply, the community’s Annual Water Quality Report will provide basic information on the quality of the drinking water supply in your community. This report will list the detected contaminants, the potential source of those contaminants, and the levels at which those contaminants were present in the water supply. Additional contaminants that may be present in your home’s water supply would include lead and copper, which generally leach from your household plumbing. For well water sources, private water testing may be needed to determine if any contaminants or other conditions exist that would require water treatment. Local public health departments frequently offer basic water testing services, while private drinking water laboratories can analyze your well water for additional contaminants that are of special concern to residents of your region of the country. Common analyses performed on well water supplies include tests for bacteria (total coliform), nitrates, and hardness. In addition, well water can also be checked for herbicides and pesticides if you live in an agricultural area. Individuals may also choose to have tests performed for radon or arsenic, especially if these contaminants are a common problem in ground water in their region of the country. The following is a basic description of several of the most common water treatment options available to homeowners. Filters can be configured in many ways, and they have varying types of mechanical and chemical reduction capabilities. Although some are designed to filter water for the whole house, a majority of the systems on the market today are designed to treat water coming from a single faucet. Some filters must be filled manually, such as a pitcher, while others, such as faucet filters and under-sink systems, are actually attached directly to the plumbing. Depending on the design and filter media used in the unit, filters are able to reduce many types of contaminants, including both aesthetic and health effects contaminants such as chlorine, chlorination by-products, lead, and parasites. Excessive levels of iron and manganese can be treated through a process known as oxidation, which is then followed by Filtration. An oxidizing agent such as chlorine or potassium permanganate is used to oxidize the iron or manganese to an insoluble form, which can then be filtered through a special media bed. The filter media bed must be backwashed and the oxidizing agent must be replenished regularly. These systems are generally large and designed to treat water for the whole house; they can also be used to treat hydrogen sulfide. Water softeners use a cation exchange resin to reduce the level of hardness in water. The resin exchanges sodium or potassium ions for the hardness ions (calcium and magnesium) as the water passes over the resin. The resin must be regenerated or “recharged” by passing a concentrated brine of sodium chloride or potassium chloride through the system. Water softeners are usually installed to treat water for the whole house, although a bypass valve is used to allow water to flow to the house when the system is regenerating. 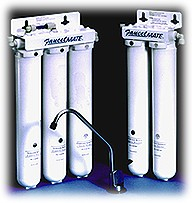 Reverse osmosis systems work by using pressure to force water through a semi-permeable membrane. These systems are normally used to produce water that contains less metals and minerals than the water that entered the system. The types of metals and minerals reduced by reverse osmosis systems include sodium and chloride and heavy metals, such as copper, chromium, and lead. In addition, some of these systems can also reduce contaminants such as arsenic V, fluoride, and nitrates. Because these systems produce water very slowly, a pressurized storage tank is usually installed so that water is available to meet the demand for drinking and cooking. A special faucet is installed at the kitchen sink to obtain water from the storage tank. Distillation systems boil water, which vaporizes and is condensed back into water in a separate chamber. During the distillation process, dissolved metals and minerals, such as arsenic, barium, cadmium, chromium, lead, and others, are left behind. There can be significant energy costs associated with using a distillation system. For this reason, distillation systems are usually designed to produce enough water for drinking and cooking only. Ultraviolet treatment systems use ultraviolet (UV) light to kill microorganisms such as bacteria and viruses, although some systems on the market are designed for treatment of heterotrophic bacteria only. As the efficiency of the UV system is affected by the clarity of the incoming water supply, it is important that turbid or dirty water first be treated by Filtration. UV systems have no chemical or mechanical reduction properties. As you can see, the different technologies shown above vary in their ability to handle specific types of contaminants. Some are able to treat whole house water supplies, while others are more useful for single tap applications. Sometimes it may be necessary to combine technologies in order to treat all of the contaminants that are present in your incoming water supply. For example, a private well water user who has bacteria and hard water may choose to install both a UV system and a water softener. Individuals who have problems with both arsenic V and chlorination byproducts could treat their water with a combination of reverse osmosis and carbon Filtration. When choosing a specific make and model of a product or system, it is important to know that it is made from materials that are safe for water contact, that it is structurally sound, and that it will perform as claimed by the manufacturer. Many manufacturers will have their products certified by an independent organization, such as NSF International, which offers assurance to consumers that the product meets the requirements of national residential water filter standards. NSF International is a not-for-profit, non-governmental organization that provides product testing services and risk management solutions to the public. For further information on drinking water issues, including treatment options, please contact the NSF Consumer Affairs Office toll-free at 1-800-673-8010 or via email at info@nsf.org.